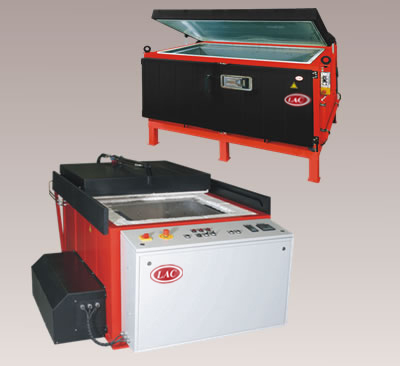 Vertical Chamber Furnace KNC/V - LAC Asia Ltd. The KNC/V is a vertical chamber furnace with forced horizontal air circulation. It is suitable for a wide range of heat treatment applications including tempering, artificial ageing, preheating, hot connecting, batch testing and drying. The KNC/V line is designed for use under normal atmosphere. The metal interior muffle allows for dustfree operation and ensures very precise temperature distribution according to DIN 17052-1, making it ideal for use in the glass industry. Chamber furnaces with forced circulation of internal atmosphere are used for all types of heat treatment (tempering, artificial ageing, preheating, hot connecting, batch testing, drying, etc.) under normal atmosphere, where a very precise temperature distribution and dynamic progress of temperature curve are required. horizontal circulation of the internal atmosphere ensures even temperature distribution in the internal furnace chamber, allowing the furnace to be set to meet the DIN 17052-1 standard.